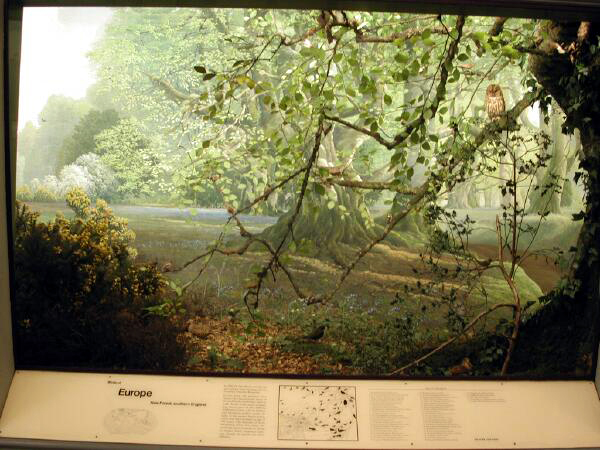 This diorama shows the New Forest in the south of England. It is about twenty-five miles from the Captain's home at Ashgrove Cottage. Here we can see many of the birds that the Captain and Doctor enjoyed observing. Here is a nightjar (Caprimulgus europaeus, same size as the Hoopoe -- the almost invisible bird with the red laser pointer on it in the right half of the image). 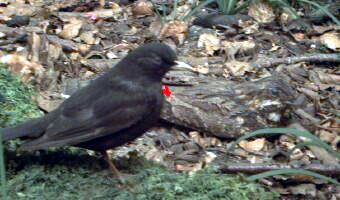 You can see the good camouflage needed by a birds that sleeps on the ground during the day, and hunts insects at night. But, I really want to talk about the plants. During the conversation of their first dinner together, the Doctor told the Captain that his only published work was one on the phanerogams of the upper Ossory. Many of you, I am sure, understood at once, but I had to look it up and found that the upper Ossory is a region of Ireland near Kilkenny, and that phanerogams and cryptogams and the two Linnean divisions of plants. Linnaeus not only described and named plants and animals; he also set up larger categories for classification. Phanerogams are those plants with visible sexual organs (flowers) and cryptogams are all the others, that is plants with hidden sexual organs. Cryptogams therefore include ferns, mosses, conifers, and groups that we do not consider plants at all like fungi and kelp. That is one of the exciting things about science and the scientific community. It is a community, people working a group in an effort to understand the natural world. Even though a great mind like Linnaeus proposed the classification of plants, as more research was done, those classifications no longer served and were replaced by more useful terminology. In this open, constantly questioning atmosphere the contributions of all are important, and amateurs like Dr. Maturin were respected and valued. Of course, the doctor saw other creatures than birds on his voyages. There are over 4000 mammal species on earth, and only 350 primate, but the Doctor seemed to have come across more than his share of those. Let's go to the Hall of Primates and take a look at some of them.